John White was born in 1849 in Micheldever, Hampshire, the son of William White, a farmer/gardener and Mary Ann (possibly Longwell). He was the second son. He joined the Marines as a drummer boy and rose through the ranks as high as he could as a non-commissioned officer, and then, unusual for the times, became a commissioned officer. His letters of reference show him as: “trustworthy, zealous and attentive to his duties” (1874); “possesses the ability to impart his information to others, and the eye to drill men as they should be drilled” (1876); “soldier-like bearing and qualities; always firm but kind; commanded a ready obedience” (1885); “has a way of getting men to work for him that I have never seen equalled” (1886) – this last was while serving in Ireland. 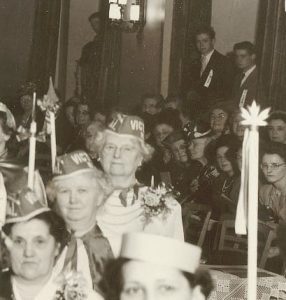 In the picture to the right, John White is wearing his full dress uniform. His granddaughter, Hilda (White) Milligan donated the mess uniform, uniform and patrol dress jacket to the Glenbow Museum in Calgary, in November, 1982. The uniform is presently in storage, but supposedly can be viewed by anyone in the family who gives the museum sufficient notice. 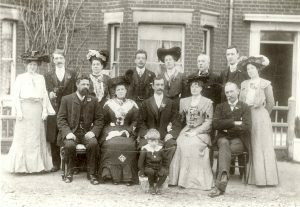 John married Hannah Mary Hopper, a domestic servant, in Deal, Kent in 1872 and they had five children, four living with them in the 1891 census; Frank Neville, Annie, Elizabeth Ann and Evelyn. Henry would have already been apprenticed. Hannah Mary died between 1891 and 1901, as John is listed as a widower in the 1901 census, living with his daughters Elizabeth Ann (Lizzie) and Evelyn (who later married a Benson). Frank drowned as a young man. “The children visited the old grandparents’ cottage [possibly Henry Hopper and Mary Ann Pitcher at Little Mongeham in Kent] and the grandmother was badly afflicted with arthritis and had to be in a wheelchair. In the village was the brew house where the beer was made. On bread-baking days the village children were sent to the brew house for a jug of “barm” – yeast from the brew, and the bread was baked in large outdoor ovens. John’s sister Annie fell into a snowdrift and got frostbitten – she was rescued by John. In the barracks, John had a batman who came in every day to do some of the main chores, such as cleaning and cooking. The daily cooking of joint and potatoes was done in a common oven in the barracks for the cost of one penny”. Hilda also wrote recollections of her parents. 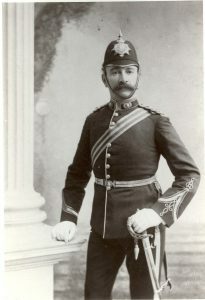 “Henry (Harry, Vorley) William White was born in the marine barracks at Walmer on the south-east coast of England in 1876. He was a premature baby, would fit in a tankard (so he was told) and was not very strong. At the age of three he started school. His sisters wheeled him there in a pram as he was as yet barely walking. In the school the infant class sat on wide steps and when they were tired they lay back and went to sleep. If they were hungry they were fed bread and jam. The schoolmaster taught the children of the officers who were in residence with their families on the barrack grounds in the morning. The foot soldiers, who were mainly illiterate, were taught in the afternoon. Dad remembered lying in the grass on a hillside watching the men being drilled. He heard so much cursing by the drill sergeant that he never used, or allowed to be used, any bad language (or even slang) in our home . He loved the countryside and the boys had plenty of opportunity to range the outdoors, roam the fields, swim in the ocean below the barracks, climb the rocks and walk and play on the sands. The family moved from Walmer to Chatham, at the mouth of the Thames, and at the age of 14 Dad went to work in London. He was apprenticed to Jones Brothers, importers , for seven years. He started out sweeping floors, learning shorthand, accounting etc. and risin­g to the position of clerk and bookkeeper. All apprentices were required to live in dorms run by the company. Rules were very strict for the young apprentices, but more relaxed for the older ones. When he was about 17 or 18 he met my mother, Kate Elizabeth Butterworth, who was apprenticed to the Bon Marche store where she was in the book department. Those were the days of the gay nineties in London and groups of apprentices would attend many of the musical comedies and theatre productions, sitting in “the Gods” (the highest, farthest back and cheapest seats in the theatre) where they saw much of the finest or frivolous entertainment London had to offer. They also did a lot of dancing. When their crowd decided to take dancing lessons Mother was in mourning for one of her family and the girls would hide with her in a cleared space behind the packing cases and teach her the steps so she would be able to join in with the crowd. Grandfather White was a very stern man. 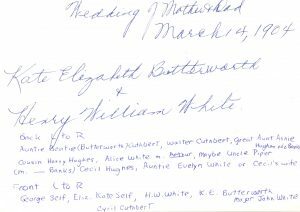 Henry William White married Kate Elizabeth Butterworth March 14, 1904. Kate (who was called “Kitty”) always called Henry “Vorley” because that is what he had been called at work, where the employee he replaced was named Vorley and the co-workers just continued to use the name. “Since there was very limited opportunities for advancement in London, Dad decided to emigrate to Canada. It was the year 1904 when a great call for settlers for Western Canada was being put out by the government and the railroads. Mother and Dad were both 28 years old. Mother decided if Dad were going she was going too and as Granny didn’t think it proper to do otherwise, they were married March 14th and sailed on the 17th, as farm help for the Winnipeg area. When they arrived signs in the store windows read “Help Wanted – No Englishmen Need Apply”. The country needed the brawn of the European farmers rather than the book lore and shop-keepers of the English cities. So they took a job as farm hands near Verdeen, Manitoba. They worked for a man and his wife and the man’s brothers. The woman had been 40 when she married and had four children in the next four years, to everyone’s shocked astonishment. She was in bed with her second child – so Mother had to take over. The people were very kind, hard working Methodists, uncomplaining and uneducated, no books, no nothing. The floor was made of wide planks with potatoes rotting in the basement. Mother had never even boiled an egg and had only her clothes suitable for her job in England, but with the woman’s help she learned to cook and scrub floors. She loved the older child and taught him to walk, which upset his mother. Dad found things even worse – trying to harness and hitch-up horses. One day the young men were howling with mirth at Dad trying to water horses without undoing the neck rein. He had only his office clothes, not even work gloves. Mother was six months pregnant and she had had enough. They collected their scanty wages, returned to Winnipeg and rented a two room shack. Dad ran down a job at Ashdowns, a hardware company. The first day they unloaded barbed wire (still no gloves) and the next day they unloaded cement. Mother cried when she saw the mess his hands were in. He tried other jobs. One day one of her new neighbors said she had ridden on a street car and the driver was the thinnest man with the biggest nose she had ever seen. It was Dad. He had a chance at a job as a bookkeeper – American method. A friend he knew told him to tell the employer he could do American bookkeeping, as with Dad’s background he could easily teach him. Unfortunately they asked Dad to demonstrate his ability – no job. 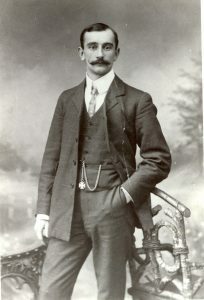 Finally about 1906 he got a job with the C.N.R. as a clerk and stayed with the company for 35 years. The shack they lived in the winter of 1904-05 was so cold there was a rime of frost on the blanket by their mouths when they woke in the morning. John was born December 6, 1904. 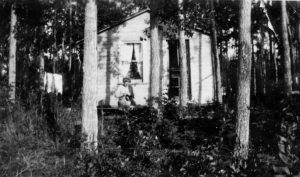 In early December the shack burned down. Since they had no money they borrowed a hundred pounds (four hundred and fifty dollars) from Grandfather White with which a tiny house 16′ x 20′ was built by a neighbor, a carpenter. It had a kitchen-dining room 10′ x 16′, a hall with staircase leading up­stairs 8′ x 10′ and an 8′ x 10′ parlor, which was only used when someone like the minister came.Up the tiny staircase were two little bedrooms under a cottage roof with four dormer windows. A few years later a 12′ x 16′ kitchen was added on, followed by a woodshed and later a bathroom was cut off one end (though I only remember having a bath in a tub on the kitchen table after which Mother washed the underwear and stockings.) To this building a screened in front porch was added. In this house all the family of five were born. I was the middle one. 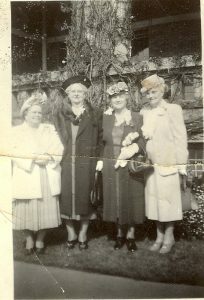 We lived at 56 Lansdowne Avenue, two or three blocks from Luxton School, which the older four attended. My brother John was attending St. John’s Technical School when we moved to Edmonton in 1919. Bob was in kindergarten and I was in Grade IV. We were about mid-way between Main Street and Scotia Avenue. The house was still being lived in when I was in Winnipeg in 1971. It was shown in a picture in the newspapers taken during the flood of the Red River in the 50’s. Our earthen cellar had water in it quite occasionally when we lived there. Once as high as the second-from­-the-top step. 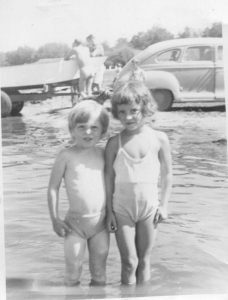 My brother John, seven years older than I, never seemed to be around home much. He was active with his friends and with scouting. He also worked regularly Saturdays and school nights with a market gardener and after he was nine spent most of his summer holidays on a farm at Roses Isle, working for wages after he was ten, gradually taking- on a man’s work – chiefly still with horses. 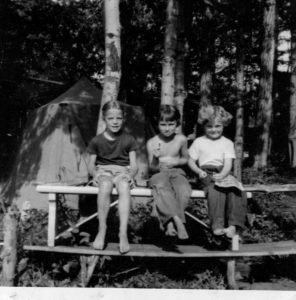 The rest of the family usually spent a couple of weeks a summer at Grand Beach or Winnipeg Beach, sometimes in a tent and sometimes in a cottage often shared with a neighbor. Mother loved the water and she taught us all to swim by the time we were seven. I loved it at Grand Beach. There were some enormous rocks on the campsite. I expect they have shrunk considerably since then. I used to go with my Dad to a gate where a man dipped milk out of a can to fill our jug and some Indians had a stall where they sold little birch-bark canoes and once he bought me one. There were sand dunes by the lake which we ran and played on and swam in the water when it was warm. Once when it rained we bought material and made doll clothes for paper dolls. John made pocket money, a nickel or dime for hauling suitcases for people from the train, no cars or roads either, at that time. At home in the evenings we all ran and shouted in the street and back lanes playing Run-Sheep-Run, Kick-the Can and Red Light. I tagged along behind the bigger ones with my friend Alice Dixon and Bob would scream “I want to come too” but Lass, my older sister, always had to take him. It seems as if the evenings were always warm. When my Dad whistled whee whoo, whee whoo, whee whoo, we knew it was time to get home in a hurry, and most of our friends also had to go in when Mr. White whistled his children home. Many a time since we in the family have attracted one another’s attention by this whistle. I remember one member of the family catching his brother’s eye by whistling as he marched down Jasper Avenue in uniform in 1942. My friend Alice started school the year before I did and I was dying to go too. Mother, in disgust, would wash my face and put on a clean pinny (a coverall apron with frill over the shoulder – white for dress-up occasions) and get a cent ready for me. About an hour later I would arrive back in tears and take my cent to Mrs. Bingham’s store to buy a sucker or some other treat from the vast array of cent candy. Little round candies on a strip of paper, jawbreakers, licorice sticks (real licorice, was about half the length of a pencil and about half as round). When you chewed it, it all frayed at the end and you could taste the licorice and all sorts of other little goodies. However, the day after I was five, November 5, 1916, I did not return within the hour and Mother knew she had another child off her hands for part of the day at least. Through some mix-up in lining-up I went into the grade one class with Alice, instead of Kindergarten. By the time they caught up to me I was getting by so I stayed. I loved school, especially learning to read, though I was glad when I had learned my phonics and no longer had to stand on a stool and repeat them as the teacher indicated them with a pointer. Mother remembered having to buy a “Sweet Pea Reader” for me for 35 cents – which was a fortune as my Dad was making about $50.00 a month. He was thoroughly disgusted when I brought it home and could read it upside down and back-to-front but I loved it. All the little girls in it wore sweet peas, bonnets. I was soon going to the library for books and we had some of our own – Line Upon Line, religious stories, the fairy tales, the English annuals and Chums (for my brothers). We also took The Saturday Evening Post, Cosmopolitan, Redbook and The Daily Mirror for years. There was always a “good” book in the bathroom and there I read quite a lot of Dickens and other classics Mother and Dad had brought from England. There was never any “trash” to read. Even if you had borrowed a poor book or magazine Mother would simply burn it if she found it. We did however get English comics, one I remember was “Weary Willie and Tired Tim”. We all learned to play cards as soon as we knew our numbers – also checkers. I don’t remember many toys except balls (which we couldn’t bounce on Sundays). There was a kid-bodied Eaton Beauty doll in Winnipeg days and I always had a teddy bear. There was also always a wagon. We had a lot east of Maine which we grew extra vegetables on, especially potatoes. We used to roast potatoes in the fire, eaten black and no salt. When we burned the tops we tried to smoke the burning stems and we would drag the vegetables home in the wagon. Dad always took us to church on Sunday morning. 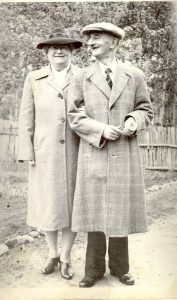 He and Mother had joined and been confirmed in the Anglican Church soon after they moved to Winnipeg and were staunch supporters all their lives. They had attended at. John’s Cathedral and I believe John was christened there, dressed in a beautiful christening robe made from Mother’s trousseau petticoat – eyelet and lace. In fact, we were all christened in it and I remember seeing it after I was grown-up but I don’t remember what happened to it. When St. Martin’s Church was built nearer us, we attended church there. At the age of three we were considered old enough to in church so joined Dad and the rest of the family. It was not long before a look from Dad’s flashing brown eyes kept us properly behaved, no squirming or asking how much longer. We always sat in the second seat from the front right under the pulpit. Dad felt if someone sat up there, there was less inclination for the rest of the congregation to fill up the back and leave the front seats empty. To this day I feel guilty if I sit anywhere else. Lass and John were both confirmed at St. Martin’s. At four we were old enough for Sunday School, three o’clock in the afternoon. At the time I started, St. Martin’s was in a field, since where we lived was the outskirts of Winnipeg. That particular Sunday a circus was set-up and we had to walk through it to get to the church. I thought Sunday School was wonderful, but imagine how disappointed I was the next week when the wonderful circus had dis­appeared. By all accounts I had a reputation up to the time I started school of wetting my pants. When this happened I simply removed the offending article of clothing and put them where my mother would find them. She was highly indignant one day when a neighboring mother sent a note home with me saying “Will you please see to it that your daughter wears pants”. After that I expect I improved but I have no recollection of ever being concerned about it. I do remember hitting the back steps too late and of jumping into a snow drift ……….on the way home from school and the enormous relief of relieving myself. My sister Lass was four or five years older than I and on her shoulder rested a great deal of responsibility for helping my Mother and caring for the three younger ones. I am rather ashamed of how little I helped. I liked to play and I liked to read and was quite adept at getting out of work. For one thing, I didn’t really care if I did a decent job and for another, Lass was so much older and more competent that anything I did failed miserably by comparison. Even after Lass went to work as a stenographer with the C.N.R. at eighteen, she was home Saturday for the main house­cleaning and I was busy with my high school work and “extra curricular activities”. to the doctor on 118th (Alberta) Avenue. It took 27 stitches to close but no infection set it. In the next while I learned what little housekeeping I had to do. But that was after we moved to Edmonton. The winter of 1919-1920 Mother took the four of us, Lass, me, Bob and Frank to California for four months to visit her sister Florence Schlosser, in Alameda, taking Lass and me out of school and I think Bob out of kindergarten. We travelled by train. At the time there was a coal strike on and we were held up frequently as we ran out of steam. I remember one day in the station in Omaha when Frank (10 months) broke a bottle or two of milk on the tiled floor. We travelled day coach, sleeper compartment or drawing room, what­ ever was available. Frank got diarrhea from drinking cream the porter managed to get, unknown to Mother, since he couldn’t get milk. If we were to be held up long enough Mother took me and the washing along, rented a hotel room, washed and put the diapers etc. on the hot water heaters to dry; went back to the station and then went back to the hotel to collect the washing. Once we got back to find the train missing – finally discovered it had been shunted to a siding and found Lass coping but terrified. We were over a week getting there. Soon after arriving at Aunty’s we were quarantined when Myrtle had a sore throat diagnosed as diptheria. 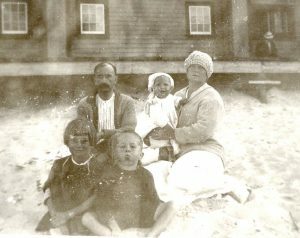 Nine children and two women in a small house- Mother and Aunty broke quarantine to go on the ferry to San Francisco to buy Christmas presents. On the ferry they ran into the doctor and nurse but diplomatically they didn’t recognize one another. They had given all the younger children shots on their B.T.M.s a day or two before and would certainly not have forgotten running kids down under the table and beds. Since Myrtle quickly got over her sore throat and no one else got sick Mother moved her brood into a huge bed-sitting, room and kitchen near Aunty’s and things weren’t so hectic. The old lady, who rented it to us had been through the San Francisco earthquake and fire and had many exciting tales to tell while we helped her shell corn for her chickens. While in California we attended Sunday school in the morning and stopped off to see a picture show on the way home. I found it a very satisfying arrangement but it was a bit harrowing for Lass, she and my cousin Charlie being the oldest, and he no help at all. The most exciting thing that happened was when the minister let a great cough and his false teeth flew into the front pew! 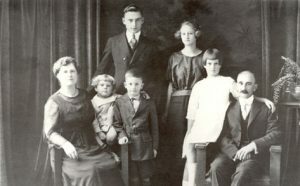 The White family moved to Edmonton in about 1920. 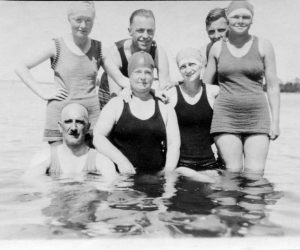 One of the first things Vorley and Kitty did was to buy a lot for a summer cabin at Alberta Beach (Lac Ste. Anne). In about 1921 Kitty and her daughter Hilda took a trip to England to visit the family (it had been 17 years since she and Vorley had immigrated). Hilda remembered hearing her first-ever radio broadcast on board the ship. After the children all left home, Vorley and Kitty retired to Victoria, BC. They continued their club work. 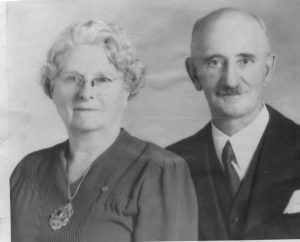 Henry William White died in Victoria on March 20, 1953. Kate Elizabeth returned to Edmonton and lived in a small apartment for a few years close to her son John and daughter-in-law Lena. In the 1960s she gave up her apartment and spent a few months at a time with either John and Lena or Hilda and Jack or Bob and Jessie. She died in Edmonton on January 2, 1965.